Are you suffering from bald patches in your scalp that are inching frequently? 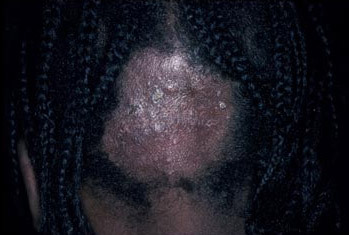 You may be suffering from Tinea Capitis, a medical condition that causes fungal infection of the scalp. What is Tinea Capitis (Scalp Ringworm)? 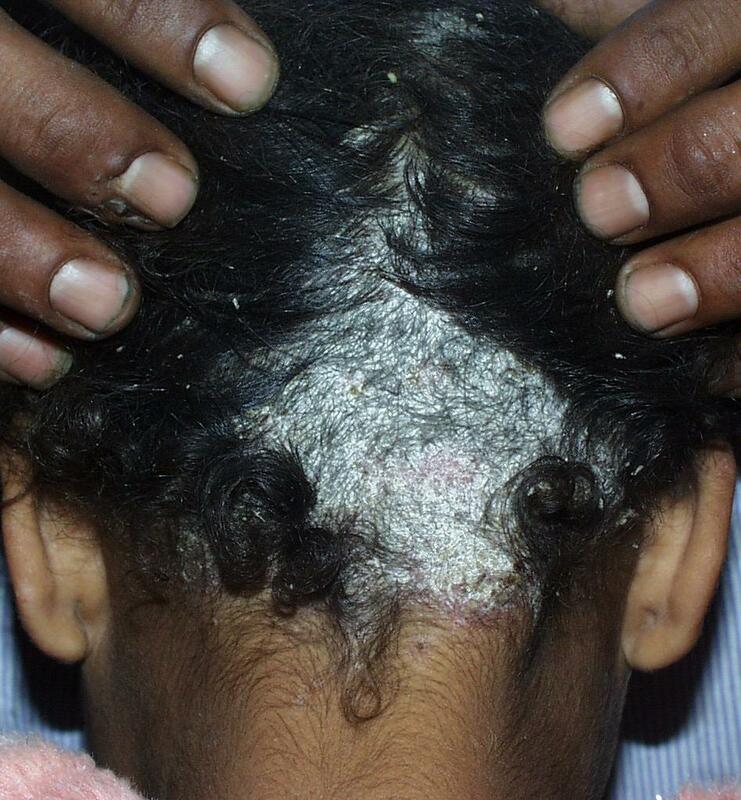 1 What is Tinea Capitis (Scalp Ringworm)? 2 Who gets Tinea Capitis? 4 What causes Tinea Capitis? 8 How to prevent Tinea Capitis? 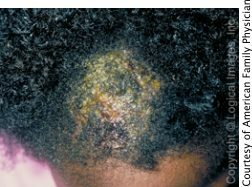 Tinea Capitis is an infection of the scalp caused by a kind of fungi known as Dermophytes. It s also called Scalp Ringworm because in Tinea Capitis scalp is the main affected region in the human body. The condition shows a sexual preference as it affects boys more than girls. It is generally seen in children aged between 3 and 7 years. Children are the usual suspects of this disease. The condition normally affects young children and vanishes as they grow up and head towards puberty. However, the disease can occur in patients of any age. Certain people are at more risk from this condition than others. If you have had minor skin injuries or have suffered from scalp injuries recently, you may get this disease. The condition also affects people who sweat a lot or have poor hygiene. Dermophytes thrive in warm, moist areas. People who come in contact with infected persons or articles used by them such as combs or clothes can also contract the disease. You can also contract the infection from pets like cats. People with low immunity such as diabetes or HIV can also be at risk from this condition. People belonging to the African race are seen to suffer from this condition. In people suffering from Tinea Capitis hair loss is common. This may lead to bald patches in the affected scalp region. Patients may suffer from itchiness in the affected area of the scalp. Read more on Itchy Scalp. The affected persons may experience irritation in the infected skin region. 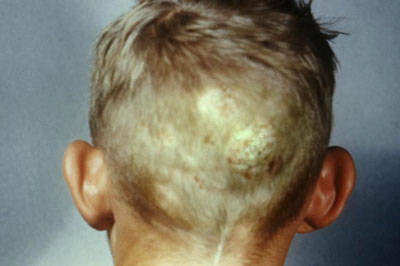 Circular lesions or sores may appear in the affected scalp area. These may be filled with pus. In pets, Scalp Ringworm is seen in the form of skin rashes. In some cases, small black dots may appear on the scalp. This happens due to hairs breaking off at the opening of the follicles. 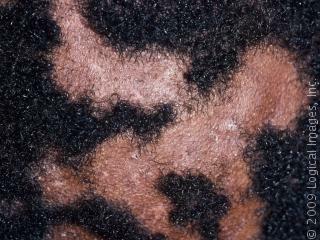 It may leave black dots on the area where the hair was. The affected skin region becomes smooth after infection. Tinea Capitis occurs when the fungi causing the disease gets the appropriate condition to thrive. Hot and humid conditions are suitable for the survival and growth of dermophytes. The parts of the human body that suffer from excessive sweating are affected by this type of fungi. Tinea Capitis is normally diagnosed by dermatologists with the aid of observations and physical tests. If Tinea Capitis is suspected, Skin Lesion Biopsy may be conducted to culture the affected skin area. Wood’s Lamp test may also be done to make sure that there is really a case of fungal infection. Diagnosis is mainly done by testing a few strands of hair from the scalp of the infected person. The Tinea Capitis Treatment can include home remedies as well as medicines. Keep the affected area as clean as possible. If you have Tinea Capitis shampoo usage can help you get rid of it. Use a shampoo containing selenium sulfide or ketoconazole to wash the region. This will help lessen the spread of infection. With removal of the ringworm Tinea Capitis can disappear automatically. It is best to keep the infected person away from pets. If your child is affected by this disease, it is recommended that you do not send him to school. The infection may also be transmitted to other children. If home remedies fail to treat Tinea Capitis medication by doctors is needed. Treatment of Tinea Capitis is generally done by dermatologists who use oral medications to cure the condition. To treat Tinea Capitis fungal infection cure is necessary. For this reason, oral medications for Tinea Capitis normally include anti-fungal medicines like Itraconazole, Griseofulvin and Terbinafine. How to prevent Tinea Capitis? Tinea Capitis prevention can be possible if you maintain good hygiene and avoid contact with people or pets who suffer from it. Bathe regularly and use clean, washed clothes and undergarments. The condition affects those areas that are moist and sweat a lot. Use anti-fungal creams and powders on a daily basis. Use anti-fungal shampoo to wash your scalp as often as possible, especially after you get a haircut. It is also recommended that you do not share clothes and articles with people who are infected with Tinea Capitis. Tinea Capitis may be difficult to understand for the average person. Here are some Tinea Capitis Photos that will help you know this condition better. Go through these pictures of Tinea Capitis to check if you know someone who has symptoms similar to this condition. Tinea Capitis is not a very serious disease. However, if the condition is not treated in time, it may lead to permanent hair loss. In some cases, scars may also appear in the infected part of the scalp. So it is best to treat it as early as possible. Home treatment is usually not very effective to cure the condition. If your initial efforts fail to bring about a change in the condition of the infected person, it is best to get expert medical assistance. Timely treatment will help you avoid a lot of serious complications in future.